Cleaning products are indispensible in all sectors of the industry, in trade, in leisure and hobby, and in the household. In the metalworking industry cleaning ranges from servicing, maintenance or repair works to commercial applications in automatic cleaning and degreasing plants. agents are adjusted to neutral, alkaline or acidic. applications of neutral, alkaline and acidic agents. mineral deposits from metal surfaces. sensitive materials, or to human skin. 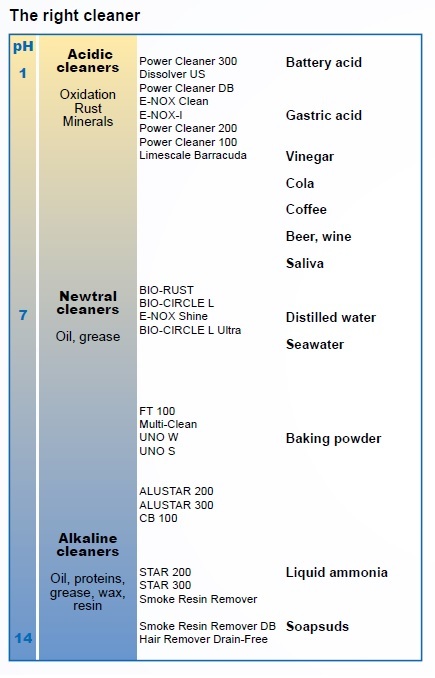 Cleaning agents that contain alkaline components.